Verizon has announced that it will be providing its own cloud storage service directly to customers as of today. 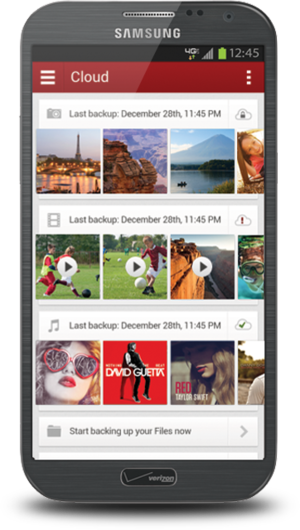 Verizon Cloud gives Android users an off-site, in-network option to supplement the storage on their mobile device. Verizon Cloud is currently only compatible with a limited number of Android smartphones and tablets, including several HTC and Motorola devices and a handful of tablets, including the Samsung Galaxy Tab 2 running on a Qualcomm Snapdragon processor. The service is also accessible through the web on Windows, Mac, and Linux operating systems. Verizon says an iOS version is imminent, as well as support for additional Android devices. Cross-platform compatibility may go a long way towards popularizing it with smartphone users who use multiple devices. The service starts users off with 500MB of free storage, a relatively small amount considering that many web-based cloud providers provide a number of Gigabytes for free. Users can upgrade to 25 GB for only $3/month, though, or 125 GB for $10. Competitors like Box, Google, and iCloud also offer applications that can be downloaded onto mobile devices, and are compatible with many more devices than Verizon Cloud is upon its launch today. Given this embedded competition, Verizon may not intend to become a large-scale cloud storage competitor with their new tool. It may be their intention to focus on adding value to their service as a cellular network. Cloud services offered by carriers are sparse, and integration of cloud services into the network provides one advantage that customers will not overlook: the ability to keep automatic backups of text messages, call logs, and contacts. This will be extremely beneficial for customers who are consistently upgrading, losing, or changing phones. This story, "Verizon Announces New Cloud Service for Android Mobile Devices" was originally published by BrandPost.